Guide introduces the fundamental concepts of copyright and provides resources to comply with and exercise it. Authors - Keep Your Copyright! 3. Is it Fair Use? Is the work is protected by copyright or is it already free to use? Do you already have permission to use the work through a library subscription or a copyright alternative (i.e. Public Domain or Creative Commons)? Does the use qualify as a fair use, as determined by a case-by-case four-factor analysis? If the intended use is protected by copyright and is not a fair use, then seek permission from the copyright owner. What Can I Use in My Courses? Before you make a request, make sure that the item is not already owned by a Bethel Library. This will prevent the charging of unnecessary fees. The Copyright Clearance Center is a large licensing agency used by many publishers and is the best place to begin looking for permission. Make requests online from copyright.com's website. 1. Search for and Select the Titles you wish to use. 2. 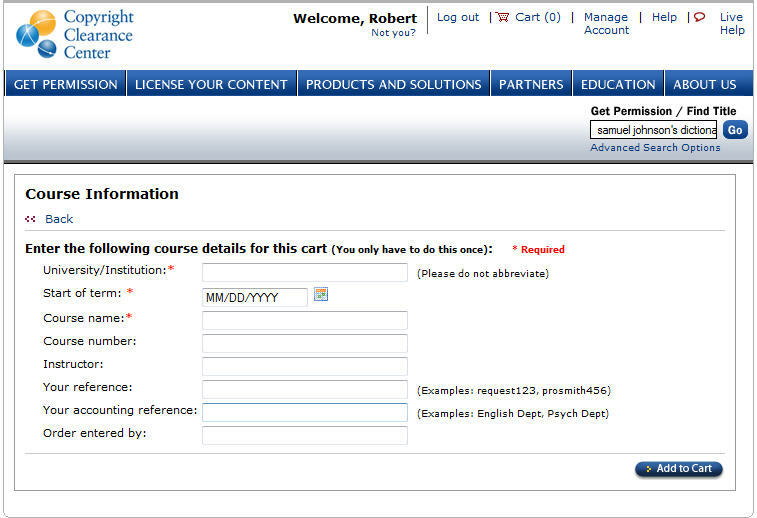 Fill out course information including all highlighted fields. Visit the Library's Course Reserves page on the website and choose the appropriate form. Thank you to those institutions whose copyright information helped inform and in some cases provide the content for this site, in particular: Cornell University. Carleton College, Indiana University Purdue University Indianapolis and Grinell College, and a special thank you for the assistance of the consultant to the Claremont Colleges, Mary Minow and Allegra Gonzalez. Please see the Additional Resources tabs for links to other copyright resources including those that helped to inform the creation of this guide.